Blood clot. 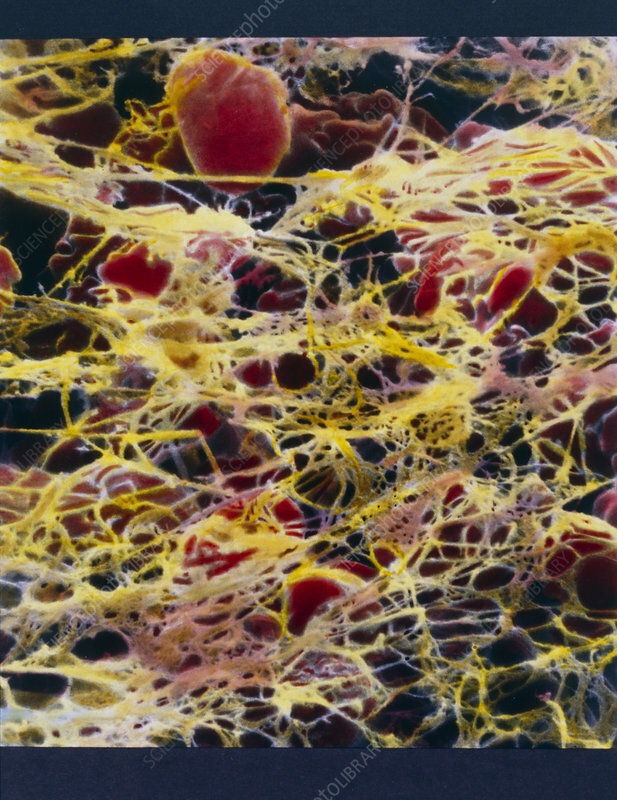 Coloured scanning electron micrograph (SEM) of a blood clot, showing red blood cells (red) and fibrin. Fibrin (yellow) is an insoluble protein produced from the blood protein fibrinogen. Platelets in the blood (not seen) release chemicals which effect this conversion when they come across an injury in the vessel wall. The tangles of fibrin fibres trap red blood cells (red), and this causes the clot, which covers and protects the injury. Clots prevent infectious agents such as bacteria from entering the bloodstream, and also stop blood being lost from the blood vessel. Magnification unknown.